Aashwas | Sinusitis Treatment by a Specialist team of ENT Specialist & Allergist. 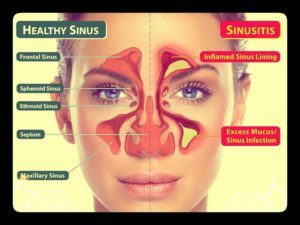 If you have nasal congestion, facial pressure, cough and thick nasal discharge, you may have rhinosinusitis, commonly referred to as sinusitis. Your sinuses are hollow cavities within your cheekbones, around your eyes, and behind your nose. They contain mucus, which helps to warm, moisten and filter the air you breathe. When something blocks the mucus from draining normally, an infection can occur. Acute sinusitis refers to sinusitis symptoms lasting less than four weeks. Most cases begin as a common cold. Symptoms often go away within a week to 10 days; but in some people, a bacterial infection develops and antibiotics may be required. Nasal endoscopy: A thin, flexible tube (endoscope) with a fiber-optic light inserted through your nose allows your doctor to see the inside of your sinuses. This also is known as rhinoscopy. Imaging studies: Images taken using a CT scan or MRI can show details of your sinuses and nasal area. These might pinpoint a deep inflammation or physical obstruction that’s difficult to detect using an endoscope. Nasal and sinus cultures: Cultures are generally unnecessary for diagnosing chronic sinusitis. However, when the condition fails to respond to treatment or is worsening, tissue cultures might help determine the cause, such as bacteria or fungi. An allergy test: If your doctor suspects that the condition might be triggered by allergies, he or she might recommend an allergy skin test. A skin test is safe and quick and can help pinpoint the allergen that’s responsible for your nasal flare-ups. Nasal corticosteroids. These nasal sprays help prevent and treat inflammation. If the sprays aren’t effective enough, your doctor might recommend rinsing with a solution of saline mixed with drops of budesonide (Pulmicort Respules) or using a nasal mist of the solution. Oral or injected corticosteroids. These medications are used to relieve inflammation from severe sinusitis, especially if you also have nasal polyps. Oral corticosteroids can cause serious side effects when used long-term, so they’re used only to treat severe symptoms. Apply warm compresses to your face. Place warm, damp towels around your nose, cheeks, and eyes to ease facial pain.